One of Mt. Hood National Forest's crown jewels — the Mirror Lake Trailhead and trail — has gotten a face lift, a polish and has reopened to the public. Mt. 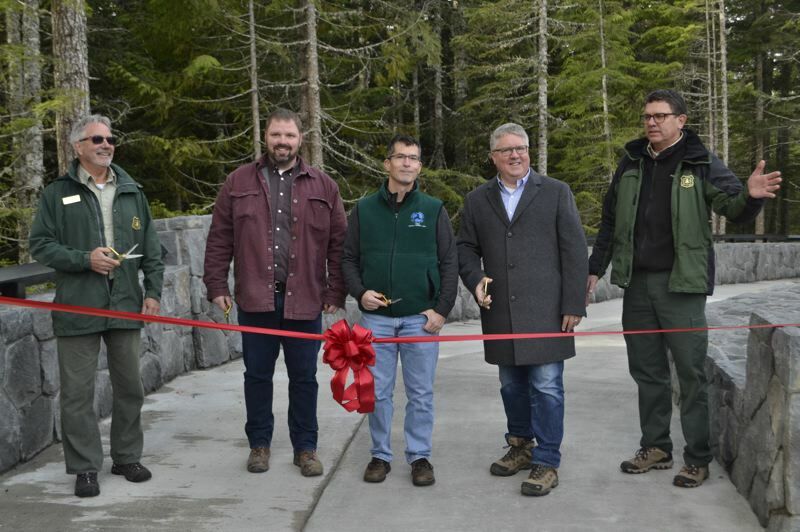 Hood National Forest officials, accompanied by representatives from the Oregon Deoartment of Transportation and Western Federal Lands Highway Division, hosted a grand opening of the newly renovated and relocated Mirror Lake Trailhead, complete with a ribbon cutting. The event took place Friday morning, Nov. 9, at the Mirror Lake Trailhead, about a mile west of Government Camp. 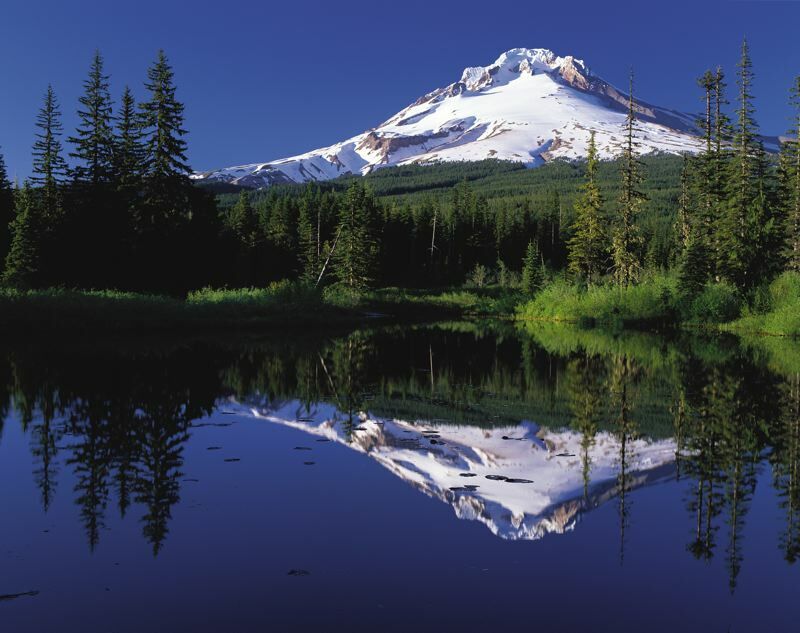 The trail takes hikers on a moderate two-mile walk to the lake, where they are treated to a spectacular view of Mount Hood. The trail continues on into the Salmon-Huckleberry Wilderness. With the relocation and renovation, the trail now features 15 wheelchair accessible landings, a quarter-mile stretch of American Disabilities Act accessible trail and 10 new bridges. The trailhead plaza includes more parking spaces with a capacity of 51 cars, concrete picnic tables, a bear-resistant trash receptacle, new benches, an information kiosk and two new vault toilets. Guests of the opening day celebration got the opportunity to hear from officials involved in the project and participate in a brief stroll down the quarter-mile ADA accessible trail section. "This project has been a long time in the making," said Bill Westbrook, district ranger for the Zigzag Ranger District. "It's going to be used by many people for many years to come." The Mirror Lake Trail is frequented by tens of thousands of people every spring summer and fall. Forest Service officials anticipates the trail will host even more winter visitors as well. "It's one of our busiest trails on the forest," said Mark Engler, West Zone Recreation Program Manager for the Mt. Hood National Forest. "It definitely ranks up there with Ramona Falls in popularity." Mirror Lake's popularity was actually part of why the Forest Service decided its relocation was important. As it was situated before, along the south side of Highway 26, visitors to the trail were parking along the highway and trekking up along the busy roadway. "ODOT's mission is to provide a safe, reliable and efficient transportation system," Region 1 Manager Rian Windsheimer said. "That's not just just for freight — as you think about freight moving from here to there — it's about serving our local communities like Government Camp, and it's also about serving the recreational opportunities of the forest and our coastlines. This is really the capstone of a $30 million-plus project to improve safety in this corridor." The budget for the trail project was estimated at $5.65 million, and construction on the began in July 2017. The overall project took three years to plan and implement and was officially completed on Nov. 7. Mountain resident and artist, Sue Allen, attended the ceremonious reopening of the trailhead and remarked that it had been quite some time since she'd hiked the area. "I stopped coming because everything was too crowded," she said. When asked if she thought she'd return now that the trail is more accessible and has more parking available, Allen said "Totally. I might do it today. It looks really nice."